I have a love hate relationship with festivals. I normally see the line ups and am just reminded that I know nothing about the music industry. I'm ok with that part though, I know my active disengagement in some areas allows me to become focused elsewhere. I still love the festival vibes, despite never knowing the line ups, I love the atmosphere of live music, hearing new sounds, being outdoors, dancing, being surrounded by eccentric happy people and everything thats on offer. The issue that leaves me stuck at the checkout wondering whether to purchase the tickets, is that I'm not normally left with good memories of the music, but memories of the sea of crushed plastics underneath our feet. Memories of abandoned tents as far as your eyes can see. The plastic and waste in general left behind at festivals is heart breaking if you open your sore eyes to see it. The last big festival I attended in Ireland, I spent the day after the festival collecting tents, sleeping bags and wellington boots from the fields of devastation. There were a lot of them, some brand new, some unusable as they had been used as toilets (yes, really), most just left behind like disposable items. What we collected was then driven to Calais in an artic lorry by a friend to help with the refugee crisis. This was a logistical nightmare and not to mention an incredibly expensive mission. Leaving behind your tent and expecting someone else to pack it down and redistribute amongst the homeless communities isn't really a viable option. At Glastonbury last year there were 5,500 abandoned tents, 6,500 sleeping bags, 3,500 airbeds and 400 gazebos all left behind. In an economy that lists homelessness as a big problem – this seems so wasteful it should be a crime. This year I'm trying to head into festival season with a more positive outlook, and deciding to support the festivals who are doing it right, trying to create positive change and showing care and consideration for our planet. I'm well aware these events still aren't perfect, but I feel the steps they are taking in creating a change in culture should be promoted. I've been working closely with Boardmasters Festival on their sustainability policies. They get it, they understand the irony in being a seaside festival supported by a marine conservation charity. They are also learning. For almost 20 years Boardmasters have worked closely with long standing partner Surfers Against Sewage to implement sustainable & environmental strategies at Boardmasters, that grow greater year on year. There is still a long way to go but Boardmasters are striving to do their best and improve where they can. From litter bonds to the Green Team, beach cleans to the mammoth post-festival clean up operation, reducing single-use plastics to implementing a cup deposit scheme; the mission is to reduce their environmental impact and run an enjoyable, sustainable festival. Boardmasters recently unveiled key goals and plans that they will implement over the next three years. The goals include continuing to reduce the amount of single-use plastic items used on site such as water bottles and cups, to levels close to zero, reduction in overall waste generated by the event, increasing site-wide recycling, reducing carbon footprint and their mission to continuously work in harmony with the local community and environment. 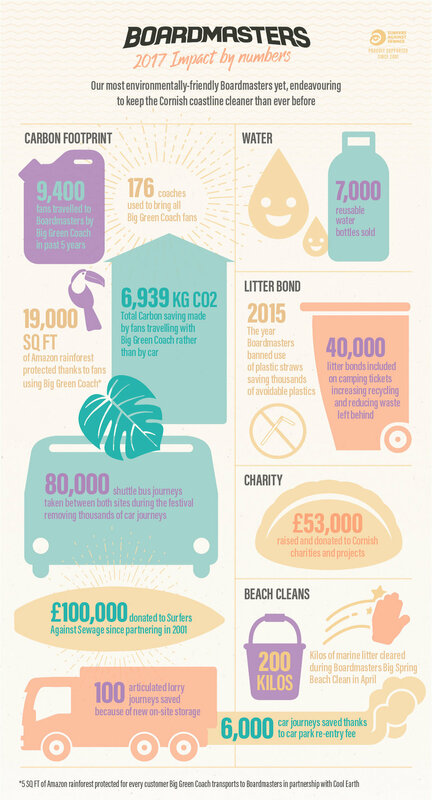 You can read more about Boardmasters green goals here. What festivals are you attending this year? Do you know of any that have zero tents left behind or that are totally single use plastic free? Are there any that are already zero waste? And if you have any further ideas on how to improve the sustainability at Boardmasters, please let me know in the comments below. I'll hopefully see you there!